The annelids or Annelida (also called "ringed worms"), are a large phylum of segmented worms, with over 17,000 modern species including polychaetes, clitellates, ragworms, earthworms and leeches. They are found in most marine environments from tidal zones to hydrothermal vents, in freshwater, and in moist terrestrial environments. The basic annelid body consists of multiple segments, each of which has the same sets of organs. They are soft-bodied invertebrates with long, narrow bodies. They posses a digestive system, a circulatory system and a nervous system. Their bodies are covered by anouter covering (cuticle) made of tough but flexible collagen. Polychaetes (meaning many bristles) are (often) brightly coloured segmented worms. Most are less than 10 centimetres long, although they can range from 1 millimetre to 3 metres. 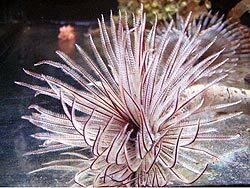 There are about 12,000 species of Polychaetes. Each segment has a pair of paddle-like fleshy paired appendages (parapodia) , used for movement and, in many species, for respiration. Bundles of bristles (setae) are found on the parapodia. Their body structures can vary according to their lifestyles which include crawling along the bottom, burrowing, free swimming, tube-dwelling or boring, commensalism and parasitism. The well developed head usually has two to four pair of simple eyes capable of distinguishing only light and dark. It also has a a pair of antennae,a pair of feelers (palps) and a apir of pits lined with cilia which act as chemoreceptors. These help the polychates find food. Their mouthss vary depending on their diet, since the group includes predators, herbivores, filter feeders, scavengers, and parasites. Most have a pair of jaws and a pharynx that can be quickly turned inside out, allowing the worm to grab food and pull it into the mouth. Most species have external gills usually found on the parapodia and a well-developed, simple circulatory system. The nervous system consists of a single or double ventral nerve cord running the length of the body, with ganglia and a series of small nerves in each segment. 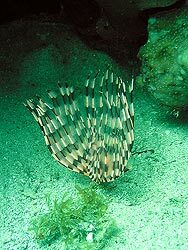 The brain is relatively large, compared with that of other annelids, and lies in the upper part of the head. Most polychaetes have separate sexes - male and female and the sperm and eggs are released into the surrounding water through ducts or openings. The fertilised eggs hatch into larvae, which float among the plankton, and eventually metamorphose into the adult form by adding segments.